From Oct. 30 to Dec. 28, 2017, the Clinical Laboratory of the Ministry of Health carried out an external quality assessment (EQA) on bioinformatics analysis of tumor somatic cell gene mutation by high-throughput sequencing, aiming to understand the status of bioinformatics analysis capability of tumor somatic cell gene mutation high-throughput sequencing laboratory in China. With the rapid development of high-throughput sequencing technology, high-throughput sequencing has been gradually applied to clinical research from the laboratory. High-throughput sequencing of tumor gene mutation has important guiding significance for clinical diagnosis, targeted therapy and prognosis judgment of tumor patients. High-throughput sequencing technology can be divided into "Experimental operation" (also known as "wet bench") and "Bioinformatics analysis" (also known as "dry bench") two parts. "Bioinformatics analysis" is as important to the accuracy of high-throughput sequencing results as "Experimental operation". Automated cloud analysis platform has unique advantages. "AccuraGen Bioinformatics Cloud Service Platform" is based on the Firefly™ technology and original algorithm developed by AccuraGen. It uses the Internet of Things and cloud service technology to build software terminals and cloud platforms. It has applied form any patents at home and abroad. The algorithm has been verified in clinical application. It promotes the development of ctDNA-NGS industry in China and is an excellent service platform for the third party. The biggest advantage of "AccuraGen Bioinformatics CloudService Platform" is the algorithm innovation supported by its own patent.Previous tests have fully proved its validity and can realize the real-time scheduling, computing and feedback automatic flow on the cloud platform. For customers with special data analysis speed requirements, it can also cooperate with top domestic operators to provide a hybrid cloud service scheme within different interfaces. At present, the Cloud Platform and its related Accu-Kit™ products have been verified by more than 2000 clinical samples from more than 20 hospitals in Shanghai, Beijing and other places. Its effectiveness, convenience and applicability have been confirmed clinically. The back-end of "AccuraGen Bioinformatics Cloud ServicePlatform" mainly relies on two levels of data. One is customer service data, and the other is medication health data. The former is biased toward the architecture layer and the latter toward the application layer, which complement each other and provide bottom-up support for flexible platform upgrades in the service process. It can automatically realize the upload of data, analysis, report generation, download to the local full automatic duty,especially suitable for normalized, matching with the guidelines of gene testing. For users who have limited technical background, AccuraGen can prepare a "user portrait" at the genetic level and recommend personalized popular science materials. The establishment of "AccuraGen Bioinformatics Cloud ServicePlatform" will be helpful to the promotion of Accu-Kit™ (a ctDNA-NGS kit). 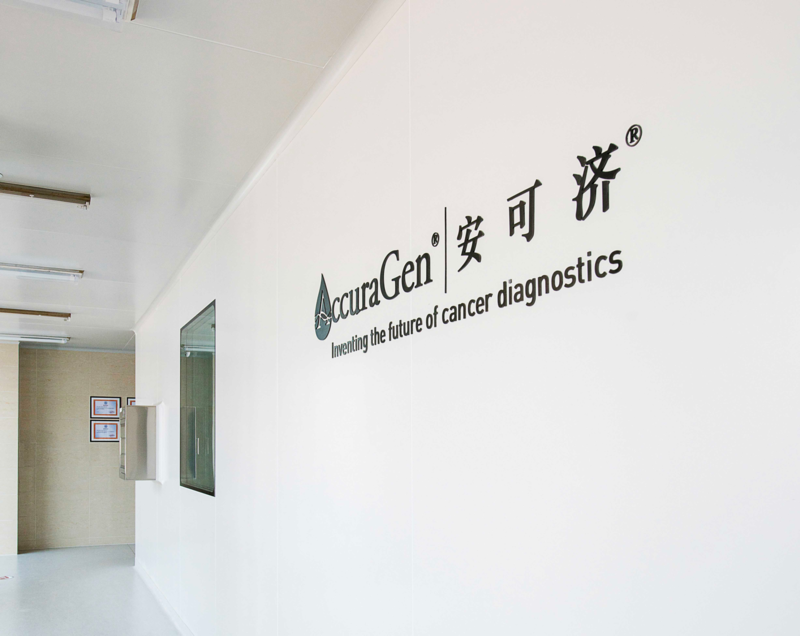 AccuraGen Holdings has always adhered to the guideline of molecular diagnosis of cancer and popularized it in the first-line clinical practice to meet the needs of clinical testing and help patients with accurate treatment. Therefore, AccuraGen Holdings took the lead in developing ctDNA-NGS kit products. Accu-Kit™ has the advantages of simple platform operation, low detection cost, low iteration pressure to point at small panel products that are specifically mutated in the NCCN guidelines can be customized for clinical medical laboratories. Accu-Kit™ can accurately detect all known and unknown or unverified mutation sites in the target genome, including single nucleotide site mutation (SNVs), insertion deletion mutation (InDels) and fusion mutation (fusions). It can also detect de novo mutation and reflect the whole picture of tumor mutation more comprehensively. It can be used to monitor the efficacy and drug resistance of cancer patients, relapse monitoring and minimal residual disease assessment, and provide the most perfect data for the whole course of cancer detection.